I wonder how T.K. Whitaker would have looked at the publication of the Ireland 2040 document. I suspect as the instigator of the first economic plans to have been given effect in this country, he would have done so wryly. In the late 1950s, early 1960s, there would have been no requirement for spin. Then Taoiseach, Seán Lemass, saw RTÉ (Radio the single, only broadcasting organ, until the arrival of RTÉ Television in 1962) as a government broadcasting service. It is in the spin that the first and second economic plans should be contrasted with the largely unsuccessful plans that have followed. Spin is that which marks the latest incarnation as being one of the more dubious attempts at national planning in recent times. Whitaker’s plans were similarly vague on details to that shown in Ireland 2040, but could not be faulted as being so lacking in vision. The first and second economic plans sought to have Ireland face forward into a wider World in ways that were not only to change Ireland’s economy, but also its society. Whitaker took the country away from De Valera’s somewhat green, agrarian, but ultimately unsuccessful economy. What and where is the vision in the Ireland 2040 document? If it exists at all, it can be defined in a fairly naked desire of Fine Gael to be in government for much of that ongoing timeframe. Where the Whitaker plans were a bold attempt to bring the country into line with the global 20th century economy, the same can’t be said of Ireland 2040, which in no way can be seen to be a sincere attempt to reposition the Irish economy, to the rapidly changing circumstances of today. Paradoxically just as Whitaker’s plans were attempts to take Ireland away from De Valera’s 19th century green idyll, Leo’s wants to Go Green 21st century style, or at least give the appearance of doing so. The spin for Ireland 2040 suggests that 20% of the capital envelope will be spent on measures to counter act climate change. This is hugely dishonest spin. Disregarding the fact that Ireland’s carbon emission figures have gone off the charts during the last seven years of Fine Gael led government, the contradictory capital commitments in this plan show a government that doesn’t understand the fundamentals of the problem, much less suggest appropriate remedies. The additional public transport measures, on the surface, should be welcomed, even if they are sorely lacking in ambition. A government actually committed to dealing with the effects of climate change would by 2040 have the bias in transport spending turned away from roads towards public transport and cycling. That is if what is included in this plan are actually commitments. It is being suggested that Cork may get a light rail system. Or is it? The plan says that a feasibility study will be carried out to see the competing benefits of a guided bus or a light rail system. This is something that was done ten years ago when The Greens were in government. I should welcome a commitment towards long term planning. The cynic in me, however, sees this less as a development plan and more as an election manifesto. One that has something for everyone in the audience. 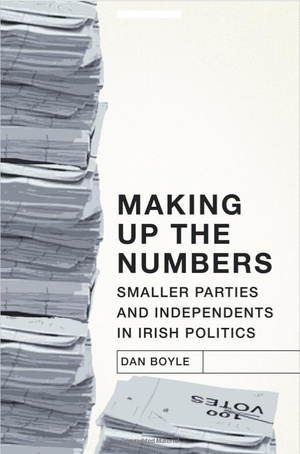 Dan Boyle’s ‘Making Up The Numbers – Smaller Parties and Independents in Irish Politics‘ published by the History Press is available at all good bookstores now. Posted in Misc and tagged Dan Boyle, Dan on Thursday at 9:53 am on February 22, 2018 by Dan Boyle. Dan, you are a brilliant example of a failed politician who thinks they are more clever than they are. The greens brought in the new emission based regime, along with FF, to favour lower carbon cars in 2007, i.e. diesel. How did that work out for you? More carbon you say? No mention of of the NOx which was the predictable result? Quite well new car sales were directed towards smaller more efficient cars. As said here numerous times the drive to diesel was EU and car manufacturer led and had nothing whatsoever to do with The Greens. You seem to be an excellent example of someone who prefers not to want to know facts. The FF/Greens changed the tax rates, not the EU or VW to favour buying diesel cars. You know the whole tax raising being unique to each member state? An 06 Yaris in 2008 was more expensive to run than a 2.0 TDI BMW/Merc. You penalized older lower carbon cars and rewarded older more polluting cars by not making it retrospective. Lol, you’re some spoofer. The likes of you are reason air quality is so poor now due to other emissions apart from carbon on these cars, and also why they are going to ban these “low carbon” cars from cities such as Paris and London. And as you admit above, it didn’t lower carbon in first place!! Far be it me to outdo you in the spoofering stakes. Price differentials between between diesel and petrol cars exist in every European country and the US. This bot meme is pretty boring. This compulsion a sad few here have (or maybe the same person with different accounts) to make these comments regardless of the actual topic I write about, is as The Donald would say – Sad. Not addressing any point, deflecting and accusing me a being a bot meme what ever that is. Good man Dan. I am new here, never commented on your articles before and have only read 2/3 of them. 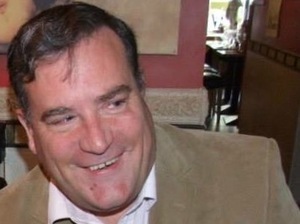 To summarise – FF/Green led initiative in 2007, Changes VRT and Car tax rules to lower emissions in government, got people to change on the whole to “lower carbon” diesels for new cars, then admits it didn’t work, carbon increased over the last 10 years and blames FG Government, in an article about spin?? Wake up man, there is a reason the greens got annihilated since then. We’re doing all right. Your boring repetition of infatuated point doesn’t change that. Why can you just own the mistake and get on with it? What mistake? Your desire to for me to seek forgiveness is your problem not mine. The issue is exaggerated on your part as is your belief that it is The Greens who should be blamed. I don’t give a damn if you think that is boring or not. You don’t care about my opinion and that doesn’t bother me. I repeat – why can’t you just man up to the gross miscalculation and move on? But you are the guys who signed this disastrous policy into law and you’ve admitted here before that not one iota of a cost benefit analysis was done prior. That’s why the public don’t trust your sort any more Dan. There was nothing wrong with the emission based system it didn’t promote diesel. Car manufacturers claimed diesel was cleaner/ They lied.. I have never driven a diesel car and I wouldn’t recommend their use. My opinion deal with it. And business won’t back anything unless it’s “incentiveized” to do so. 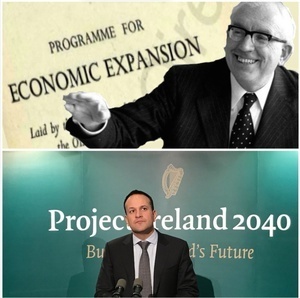 “Where the Whitaker plans were a bold attempt to bring the country into line with the global 20th century economy, the same can’t be said of Ireland 2040” – giggle. This piece is extremely vague. I know you are against SOMETHING but I’m not sure what, or what your alternative suggestions are. With critics like this, who needs allies! Still not sure where this assumption on Ireland’s carbon emission figures but anyways. The only thing I understand is that we have a lot of cows and they fart a lot. If that is the case than the issue is with the agricultural sector not the government. It doesn’t matter how ‘green’ the general public is because if we are producing such large amounts of dairy and beef products then our emissions are not going to be massively reduced by anything other than less cows. or adding a small amount of seaweed into the cows diet cuts their methane output by about approx. 99%. Is that true? Do you have a link? Don’t fall for it Nige! No Mildred if it’ll cut a cow’s methane emissions it might cut mine! Good grief. Could definitely be implemented here. Seaweed all over the place. Always knew Carigeen Moss was magic. if it’s the burps then I’ve probably contributed a fair bit to the hole in the ozone, so. FG will demonstrate real commitment to climate change when it tackles agriculture. For a realer vision of 2040, just imagine Dan Boyle still in his bunker, like one of those Japanese soldiers years after WW2, still re-litigating his time in government. Because being public in what I say and do is being in a bunker, and countering others opinions is being litigious. What a strange world you inhabit. Ah most of it gets recycled back to the State. And I hardly do nothing. I do great deal not recognised by the dogmatic formularies of the ruling State. Besides if I make it to 77 I’d be pretty happy with life. Hi Dan,given the housing crisis,which is about get a lot worse with the state choking on solving it, whats the ‘plan’ for housing ? Dump more state assets to yank vulture funds, have the ‘markets’ solve all the govts problems. Given the complete and absolute failure of his creations,the central bank and the dept of finance,with most their senior staff in out the courts, is it time to revaluate Whitakers,in my opinion overrated status ? There’s no doubt he was a fiscal conservative and also true the shake applied to the economy was never practically applied to the civil service itself. Thanks Dan,I’ve always been confused about what exactly his central bank does,debt management and issuance was stripped from his bank years ago. Appointing a few tenured Trinity professors via the revolving door or wasting millions on a new HQ,hardiy restores confidence in a failed institution. since 2008-18 as left during the 50′ and 60’s….then we have the Jobpath exercise that massages the figures, Its time that all the pundits recognised that all there plans are just electioneering stunts. Net Migration between 2008 and 2017 (the latest on CSO) is actually -300 (rounded). There have been 711,600 Immigrants and 711,300 migrants. Still banging on about emissions and “Climate Change”. You should know the rest of the world has moved on and now only pays a vague kind-of lip service to this failed agenda. if ever there was a Sheeple (Sheepson? Sherpon? ), it was the kind of right-wing, fact-bashing, conspiracy-loving, quasi-bot exemplified here by Sentient Won. It really baffles me the amount of people who use a kind of double-think to convince themselves that they’re true enlightened mavericks by blindly following authority. Why do you even bother replying to them then? If you think she’s right why are you attacking her? Dan, no matter how often you promote it I shall NOT be buying your book. As a ‘green leaning ‘ person I have /had serious issues with your Party’s conduct in Government and your embracing of so called ‘Green ‘ policies which were anything but. Talk about feet of clay.